Descending into Anchorage International Airport (ANC) depends on which runway is being used for arrivals. The usual runway used in the winter is Runway 07 (70 degrees). During the summer, Runway 07 and Runway 14 (140 degrees) are usually used for arrivals. 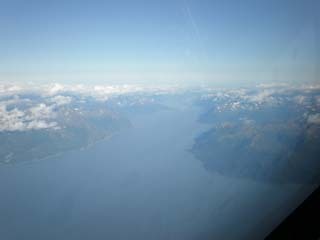 If you are landing on Runway 07, then you will probably be descending over the Turnagain Arm. If this is the summer, there is probably clouds that obscure a large part of the terrain below. But if you can see, then you might be passing over the town of Whittier, with the Portage Glacier close by. This is at the eastern end of Turnagain Arm and then you might be able to see the Arm itself. Many times you will be right over Alyeska Ski Resort and can see some of the ski runs and lifts, and also the town of Girdwood. 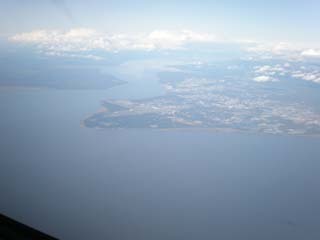 The airport and the city of Anchorage will appear off the right-hand side of your aircraft. The large airfield to the north of ANC and the city is Elmendorf Air Force Base and is used as an alternate airfield for flights into ANC. The approaches to Runway 07L/R (left and right) descend over Fire Island, just to the west of the airport. Fire Island is the location of the ANC VOR (VHF Omnidirectional Receiver). These runways are 10600 feet and 10900 feet respectively. The airport terminal will be on the left-hand side of the aircraft. Many times during the summer, with the winds out of the south, Runway 14 will be used. This is usually a bit trickier descent and approach. This is because the final descent into ANC is started over mountainous terrain northeast of the airport. ATC (air traffic control) will usually descend you to 8000 to 10000 feet, and no lower to stay well clear of the mountains. If you haven't slowed before then, it will be pretty hard to descend comfortably down to get on a good stabilized approach into Runway 14. Descent must be at a pretty good rate and you will be passing over Knik Arm with Anchorage and the airport off the left-hand side of your aircraft. Many times landing on Runway 14, the winds can be a bit gusty with rain. There is a cliff on the approach end of Runway 14 which can also contribute to a bit of turbulence. Runway 14 is 11584 feet and the terminal will be on your left-hand side. Welcome to Anchorage! Here are some places and things I have done on my many long layovers in Anchorage. Three places that I have eaten lunch and dinner frequently are the F Street Bar, Humpy's and the Glacier Brewhouse. The F Street Bar is small so sometimes you might end up standing, but they have great food and beer. It has aviation stickers from airlines and military units all over the place. I especially like the "halibut chunks", with Alaskan Amber on draft. Humpy's is more the touristy place and is about three times larger than F Street. Their food is good and bar is large. They also will have a band at nights. Glacier Brewhouse, as the name implies, is a brewpub that is pretty big and is very comfortable with a fire going. Their food is quite good and of course is complemented by their excellent variety of beers. 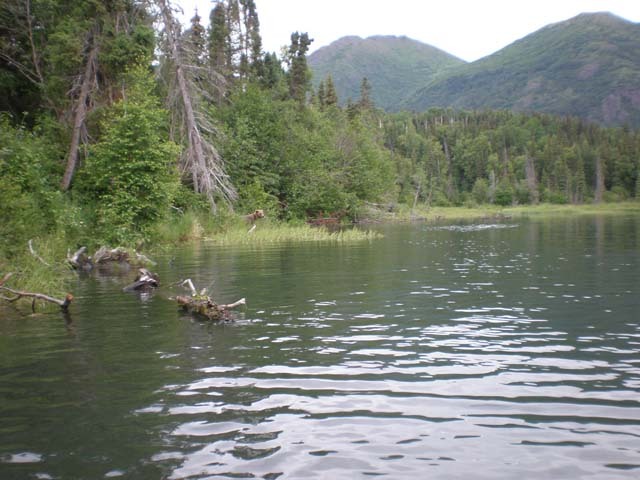 A huge reason for many to go to Anchorage is the outdoors and the fishing it offers. In town, is Ship Creek where you can see many people fishing. There is also a fish ladder that you can observe big salmon getting ready to swim further upstream. If you don't have your own gear (including boots!, a must in the Alaskan mud!) then there is a place you can rent all, and even get a one-day fishing license from a small shop on Ship Creek. Not too far away (about 300 yards from Ship Creek), closer to the city, a flea market is held on weekends during the summer with a wide variety of Alaskan crafts and foods. Fishing for salmon in the Anchorage area, from 2.5 hours south to the Kenai River, to 1.5 hours north to the Wasilla area, takes close attention to the openings on rivers and streams, tide and runs of the various kinds of salmon. Besides local sport and fishing shops, the best place to get this information is the Alaskan Department of Fish and Game website and the Anchorage Daily News website. These websites can give as close as an update on the fishing action as one can get if you are just visiting and going without a guide. The different variety of salmon, where they are running, and what people are using to be successful are featured. If you are driving south, the only way to reach these places is the Seward Highway. This is a very good road and there are several places where there are passing lanes, but be aware that if a car crash happens then it can tie up traffic for quite a while . Especially if you are catching a flight out of ANC, leave plenty of time if, by a small chance, this happens. Needless to say, the fishing and beauty of this area, and the Kenai Peninsula, can't be covered in this short article. Just be prepared to see a wide variety of wildlife and great fishing action! Do you have special places that you visit while in Anchorage? If you have special places that you visit while in Anchorage, please share! Especially if these are not the usual tourist places! Please enter a title for your suggestion! Your suggestions will appear on a Web page exactly the way you enter it here. You can wrap a word in square brackets to make it appear bold. For example [my story] would show as my story on the Web page containing your story.